I will demonstrate how to integrate a Spring Boot web application with Keycloak and configure an authentication flow that requires a two-factor-authentication with user credentials and also one-time-passwords. In the following tutorial we will install a fresh new Keycloak server instance and configure realms, roles, users as well as one-time-password (OTP) authentication step by step. Afterwards we’ll implement a web application with Spring Boot that exposes some secured resources to authenticated users within a specific role and communicates with our Keycloak server instance to authenticate users. Keycloak is easy to install, either by downloading the binaries from the Keycloak website or using Docker. We should be able now to access our Keycloak server by pointing our browser to the address http://localhost:8080/auth. Further details can be found in the excellent documentation on the Keycloak website here: “Server Installation and Configuration“. If not interested in the details of the Keycloak configuration, please skip to the Spring Boot section of this tutorial. Now that we’ve got a running server we need to add some configuration like realms, users, roles and security configuration.. When running Keycloak for the first time, we’re required to create an administration account and set a password for this administrator. Then we’re able to log into the master-realm at http://localhost:8080/auth/admin/ using these credentials. We’re creating a new realm that will be used for our web-application named “tutorial“. 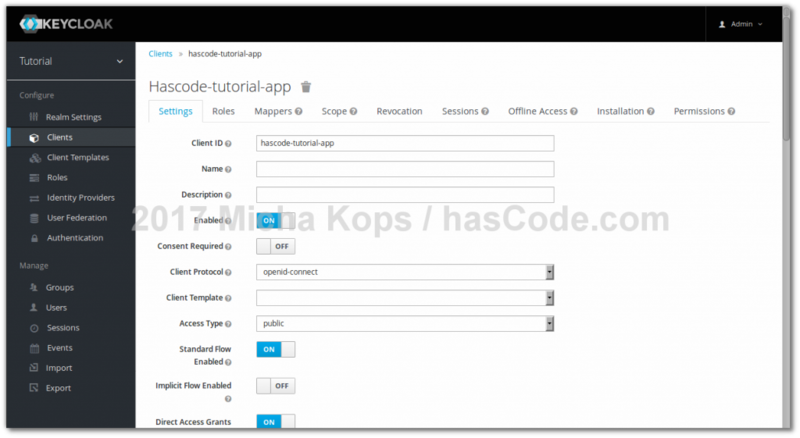 In the next step, we’re creating a new client named “hascode-tutorial-app“. Create new role named “user“. In our Spring Boot application we’ll be restricting access to a specific page to users with that role. We’re now creating a new user with username “lisa“, for now we don’t need to add any other information here. In the user credentials screen we’re adding a new password of choice for the user and we’re disabling the setting for temporary credentials as we do not want our user to change his password on first login. Finally in the tab named “Role Mappings” we’re assigning our user “lisa” to the role “user“. Now we’re done with the basic configuration and just need to fine-tune the settings for one-time-passwords. In our realm configuration in the “Authentication” settings we’re modifying our “Flows” configuration and we’re setting the value of OTP Form to “required“. In the tab “OTP Policy” we’re updating the number of digits for our OTP code to 8 digits. Now we need and OTP client that acts as a key generator and may be installed on our smartphone. Three apps for Android that I know are.. Most times I am using FreeOTP and I have tested the Keycloak interaction with this app. Having all we need for now, we may now start a manual test of our security strategy. We’re accessing the account view of our “tutorial” realm by accessing the following URL in our browser: http://localhost:8080/auth/realms/tutorial/account/. In the screen, we’re entering our credentials “lisa” as username and our password. In the following screen we’re required to setup our OTP key generator. This is done by simply scanning the provided QR code with our OTP app and entering the generated code. We should then be redirected to the Keycloak account configuration. As we’re now sure that everything is working as expected on the Keycloak side, we’re ready to implement a connected web application. We’ll be implementing two different solutions with Spring Boot: one simple application using only spring-boot web and another one using spring-security. There is an excellent article available in the RedHat Developer Blog (as many others) that describes in-detail how to configure Spring Boot with Keycloak and I highly recommend reading it. In addition there is a dedicated chapter in the Keycloak documentation about the Spring Boot Adapter. The complete descriptor file is available in my repository here. In our controller class, we’re defining a data-transfer-object for articles and two actions to render a list of blog articles and to logoff a user. To logout a user we’re accepting the HttpServletRequest as method-parameter and use its logout method. Our application class contains the usual minimalistic Spring Boot setup, nothing special. This is our Thymeleaf template to display a list of given blog articles. More detailed information about the Thymeleaf template engine syntax can be found in its documentation. In addition to the settings above, we’re adding a server.port entry set to 8081 because port 8080 is already used by Keycloak. Finally we’re ready to start our application and find out if the integration with Keycloak is working as expected. Afterwards we should be able to access our application in the browser by pointing it at http://localhost:8081/. The logout action terminates our authentication and we’re redirected to the logout page. In a real production app, there is often Spring Security involved that’s why we’re modifying our existing application to work with Spring Security now. To make it work we only need to apply one dependency, modify our configuration file and add a configuration class to the application. In the next step we may remove the following two entries from our application.properties config file as we’ll be handling necessary roles and secured URL schemes with Spring Security mechanisms in our security configuration class. Last but not least we’re adding the following security configuration class to our application. Here we’re exposing instances of KeycloakConfigResolver and SessionAuthenticationStrategy for injection and we’re adding global security configuration as well as role-restrictions for our articles view. That’s all that we needed to change and when re-running our application we should be able to run the same authentication flow as in our simple version. When interested in implementing identity as well as resource servers with Spring Boot, please feel free to visit the following article of mine: “Setting up an OAuth2 Authorization Server and Resource Provider with Spring Boot“. This entry was posted on Sunday, November 26th, 2017 at 7:29 pm	and is filed under Java. You can follow any responses to this entry through the RSS 2.0 feed. You can skip to the end and leave a response. Pinging is currently not allowed.